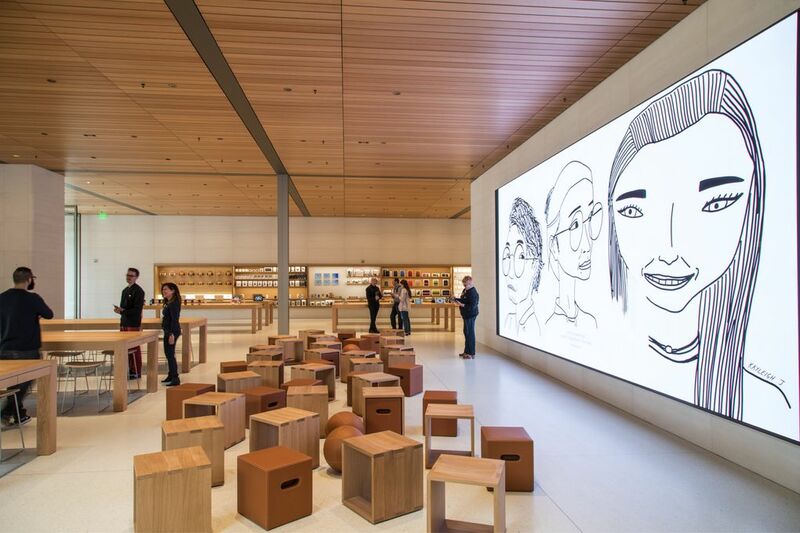 Apple’s new University Village store emphasizes experiences and education as retailers try to give people new reasons to go into physical stores. 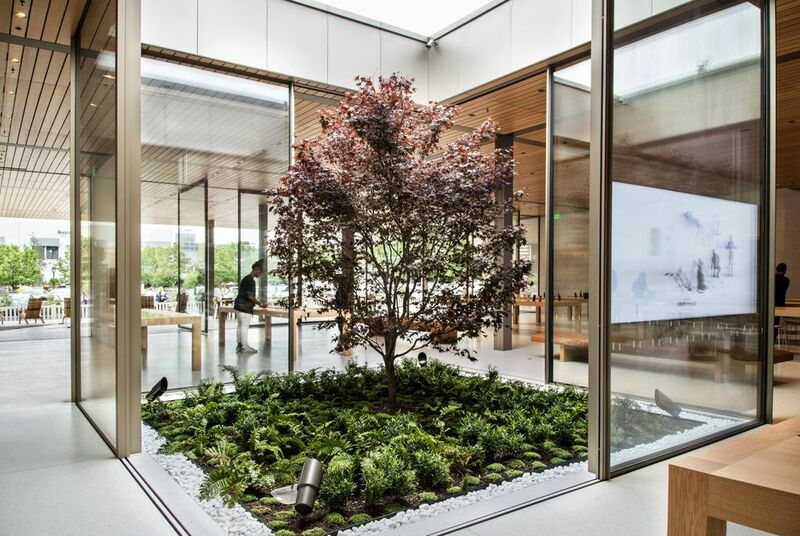 Apple stores have long been destinations, able to attract large and loyal crowds on the strength of — and hype around — the company’s products and the standout design of the spaces themselves. But even Apple has been tweaking its store formula in recent years to emphasize activities over purchases, a trend that more retailers are embracing to keep their physical presence relevant as digital commerce accounts for an ever-greater share of sales. The centerpiece of the tech giant’s new store in Seattle’s University Village, just steps away from its old one, is not a display highlighting the latest phone or watch, though those are still present in sleek wooden tables and showcases set off to the sides of the museumlike space. It’s not the Genius Bar, a high-touch tech support station that anchored a previous generation of Apple stores. Instead, the highlight here is an open central area called the forum. It’s outfitted with a movie-theater-sized, super-high-definition video display surrounded by wood and leather seating, the starting point for guided photography walks or coding classes for kids. The broader store is designed to be a semipublic gathering space where you could come and just hang out in a custom-built teak Adirondack chair on a broad white terrazzo porch, admire the anodized aluminum trim details (custom tinted to match the casings of Apple’s products) and maybe drop $1,000 on a new iPhone while you’re there. 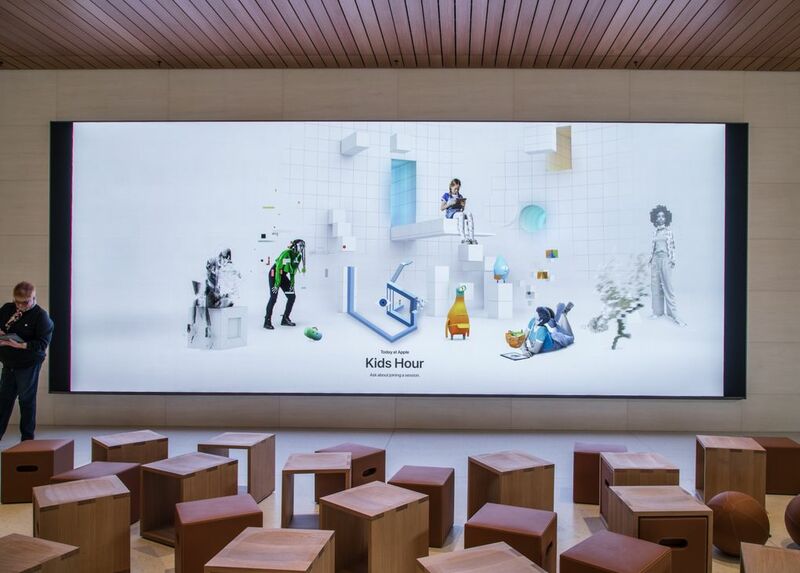 Since 2015, Apple has been building its new flagship stores and remodeling others around this concept, which supports the company’s revamped program of free daily classes, events and entertainment. 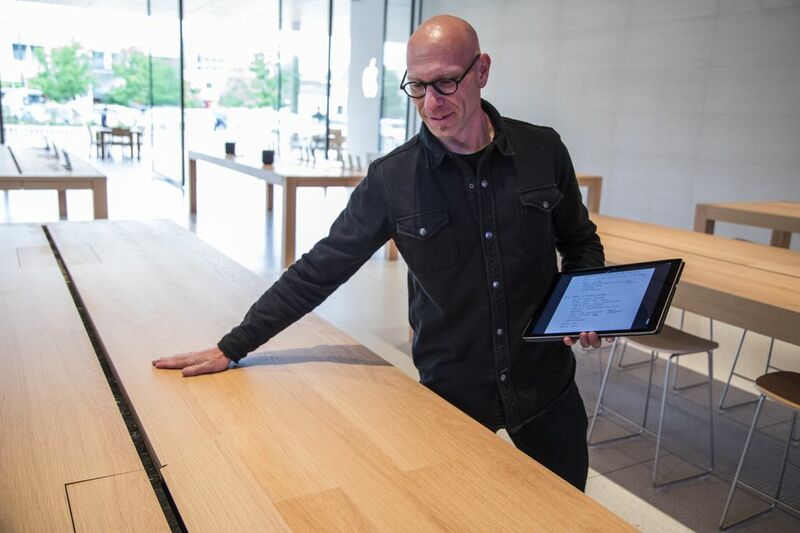 “We really want that town-hall feeling to be the anchor of the store,” said BJ Siegel, Apple’s senior director of store design. 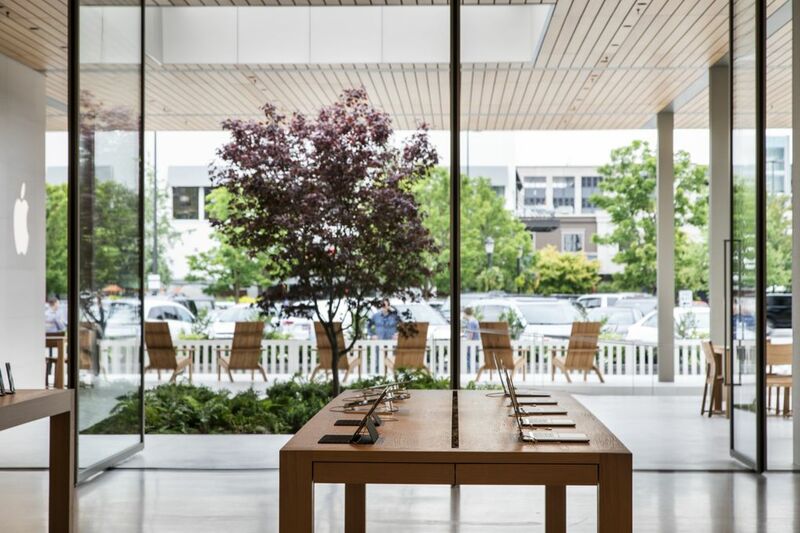 On Thursday morning, construction contractors in hard hats and nattily dressed Apple employees walked around the white limestone and glass exterior, tidying up any last smudges before the store’s Saturday opening. Security guards in black jackets stood at the building’s four corners under broad awnings paneled in American white oak as curious shoppers peered in to get a glimpse of the space, which was widely assumed to be an Apple store but was shrouded by a construction fence until the notoriously secretive company announced it earlier this week. 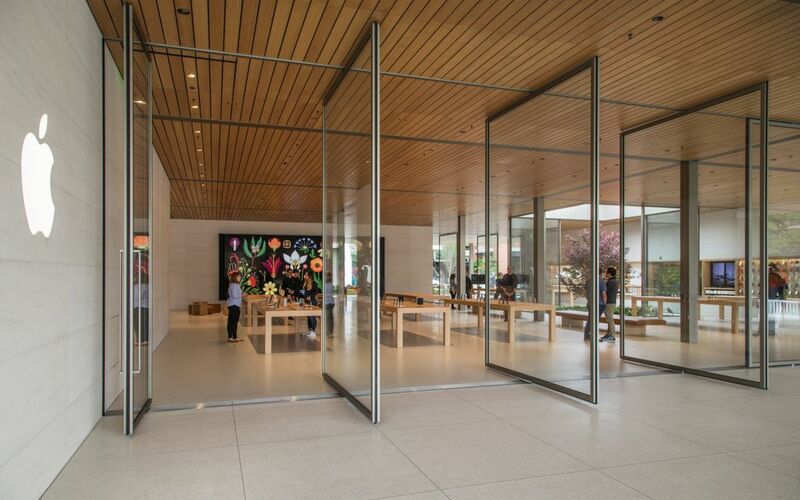 The store has five entrances composed of 9-foot-wide glass panels that reach to the 14-foot ceilings and pivot open, letting the breeze flow through and intentionally blurring the line between the interior retail space and the surrounding porches. In a light well inside, a Japanese maple grows surrounded by ferns. A raised planting bed filled with Bowhall maples whose leaves will turn bright red in the fall separates the new Apple store from the old one’s glass and metal facade. The old store, which opened in 2003 — before the iPhone was introduced — will close Friday evening, having seen some 10 million visitors. The old store’s 210 employees are all expected to work in the new store, which is about 50 percent larger, Siegel said. 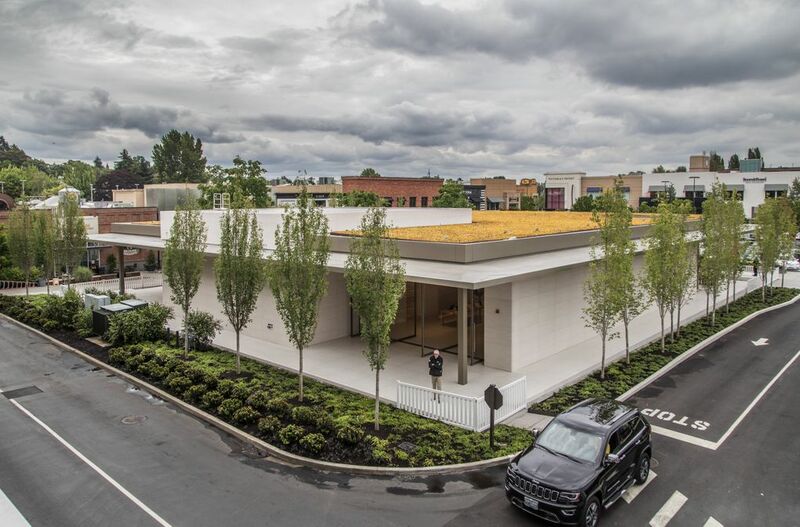 The green roof, invisible from ground level, is planted with sedum and already frequented by honey bees, a dramatic change from the asphalt parking lot the store replaced. Apple would not confirm either the price tag or the exact square footage of the store. A building permit indicated a valuation of $5.2 million for the building — though that is only an estimate for purposes of calculating fees. The King County assessor pegged the building at 11,600 square feet on the ground floor and 4,140 square feet in the basement. Other building permits suggest the retail space on the main floor is about 7,000 square feet. Siegel said the exterior spaces are larger than the interior retail space. The lost parking spaces will be replaced — and then some — by another major building project underway at University Village, part of a five- to 10-year expansion plan. Crews are preparing the ground for a five-story parking garage on the property’s west edge, yielding a net 300 new spaces and 6,000 square feet of additional retail. As for other phases of the expansion, which call for an additional 94,000 square feet of retail space, the timeline is still to be determined. “With retail evolving so quickly now, we really just wanted to get ourselves through the city process and allow us the ability to expand with the demand,” said Susie Plummer, U-Village vice president and general manager. More stores, whether they be long-standing brands or online sellers opening their first physical locations, are being designed with events in mind. “You cannot be the store you were 15 years ago,” said Rosie O’Neill, co-founder and co-CEO of Sugarfina, an adult-candy purveyor with two local locations. She described a collaboration with Hello Kitty that drew a 400-person line to Sugarfina’s store inside a Vancouver, B.C., Nordstrom, and even a wedding held in the chain’s Pasadena location. University Village, styled as a “lifestyle center” and surrounded by upscale neighborhoods, has long sought to provide entertainment and other experiences that go alongside shopping, such as summer concerts and a Tuesday playdate with activities for kids. Many of the shopping center’s local merchants have followed suit, said Plummer, who has managed the northeast Seattle institution for 18 years. Now, more national brands are doing the same. “In the last three years, we’re seeing more retailers create their own events,” Plummer said, citing Williams Sonoma’s partnerships with local chefs for cooking classes. There are also crafting camps for kids, Sunday-morning workouts, running meetups and gardening classes. Seattle-based women’s running and athletic apparel company Oiselle opened its first store at U-Village outfitted with merchandise racks that can be hoisted out of the way when it hosts customers to watch Olympic running events, for example. Another new arrival to the center this week is Massachusetts-based beauty products retailer Follain.com, which hosts product-educational events in its stores.